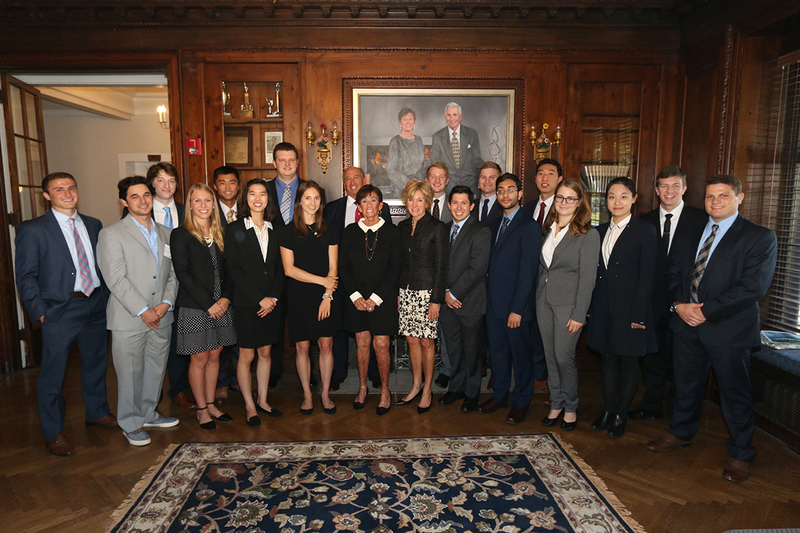 The eleventh class of Weatherhead undergraduate students was inducted into the Wolstein Society September 22. The Wolstein Society recognizes outstanding undergraduate students in their senior year who represent the spirit of enterprise as demonstrated by leadership, scholarship, community service and professional will. The 2017 Wolstein Society inductees represent the true meaning and character of the Wolstein Society. Not only are these students exceling in the classroom, they are also making a positive impact on campus and in the community. These students are active members of Alpha Kappa Psi, Beta Alpha Psi, Greek Life, Varsity Athletics, and many more organizations. This year’s inductees include members of the varsity baseball, cross country, football, soccer, tennis, and track and field teams. They have held leadership positions in Alpha Kappa Psi, Alpha Phi Fraternity, Beta Alpha Psi, BlueCWRU, Club Ultimate Frisbee, CWRU Footlighters, International Club, Northeast Ohio Student Venture Fund, Sigma Alpha Epsilon Fraternity, Sigma Chi Fraternity, SpartanTHON, and Zeta Psi Fraternity. Every inductee demonstrated their commitment to professional will by having at least one internship during their time at Weatherhead. They interned in a variety of fields including corporate finance, investment banking, marketing, public accounting, recruiting, sales, and talent management. A few students focused on entrepreneurial endeavors and start-ups such as RaveNectar, SplashLink, and Tock. The future is bright for these students as they are planning to start their careers at firms including Deloitte, KPMG, PricewaterhouseCoopers, and RaveNectar. Also, several inductees plan on continuing their education in graduate school. As much of an impact that these students have had on Case Western Reserve University and the Cleveland community, we know that they will continue to possess the spirit of the Wolstein Society as they begin their future endeavors. We congratulate them and wish them the best of luck!